An Oscar-nominated historical drama directed by Deepa Mehta. I played Narayan, an idealist young lawyer and follower of Gandhi. It is 1938 and India is still under British rule. Child marriage is common practice and widows are ostracised from society, expected to spend their lives in poverty and prayer. When seven-year-old Chuyia's husband dies her head is shaved and she is left in an ashram by her father. There she befriends the beautiful Kalyani and assists in her budding romance with Narayan. But although legal, the re-marriage of widows is still taboo. With years of tradition stacked against them, can the lovers possibly have a future together? "I will always love this film. It took me to the Oscars, an amazing experience. I think women directors, especially women writers, are exceptional and I love to work with them. For this role I had to learn to wear the dhoti, play the flute and recite in Sanskrit. And I couldn't even walk like John Abraham! Deepa kept saying, 'Don't walk like a hero!'. 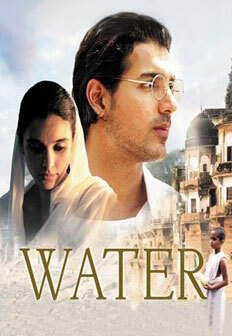 Unfortunately the movie wasn't accepted in India but was nominated as Best Foreign Film as Canada's entry."